A 911 dispatcher fields a call, only to realize it was coming from her own home. The dispatcher was able to keep calm and helped save her son’s life. Maverick was in the bedroom playing as his father moved furniture into the living room. “I heard him say an address and I perked up and then I heard him say it again and I recognized that as my own home address,” she said. Calmly she began to assist the caller – her fiancé, Robert Kimball. 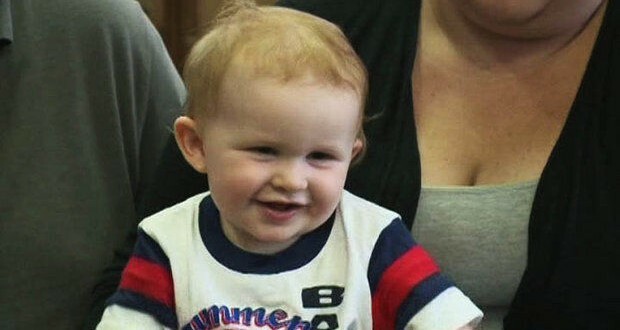 Her 14-month-old son Maverick had been playing in the bedroom while his father moved furniture in the living room. But Kimball soon realized something was wrong. He found his young son choking on a metal washer and called 911 for help. Kimball, a former hospital orderly, continued to try to dislodge the washer while Melchor was on the line listening in agony. Finally, the washer broke free of Maverick’s airway and he began to breathe. On Wednesday, Maverick was well on his way to recovery. In her years as a 911 operator Melchor has come to the aid of dozens of people in distress, but it is certain that one call will always remain foremost in her mind.